There are executives that talk a lot about valuing customer happiness, and then there’s Loni Spratt. Spend even a few minutes around Loni, Director of Customer Success at Entelo, and you’ll understand that it’s not just talk for her. She’s truly passionate about keeping customers satisfied, and it’s no wonder that she fits right in at a company like Entelo. At Entelo, a provider of recruiting analytics software, everything comes back to helping their customers achieve their recruiting goals. As the leader of the customer success team, it is Loni’s responsibility to not only help Entelo’s customers achieve their goals, but also to turn their insights and challenges into meaningful feedback for the rest of the organization. This could mean improving the customer experience, improving the products themselves, or just doing a better job of demonstrating value to customers. However, in order to do these things, Loni first needed a way to make sure the company was monitoring customer satisfaction in the most accurate and timely way possible. 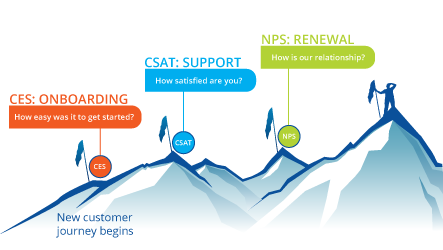 Obstacle: Monitoring customer health via email surveys was time-consuming, and feedback was coming in too late to respond to customer issues. When Loni joined the company, Entelo collected Net Promoter Score data as part of a twice-a-year survey, performed using a popular free survey tool. This approach made it difficult to gain an accurate understanding of how customers actually felt. For one thing, only conducting a survey twice a year meant that serious customer satisfaction issues could go unidentified (and thus, unaddressed) for months at a time. In addition, Loni was not achieving the level of customer response she hoped for. Results: Gathering customer feedback within Entelo’s SaaS application helps to reduce churn. 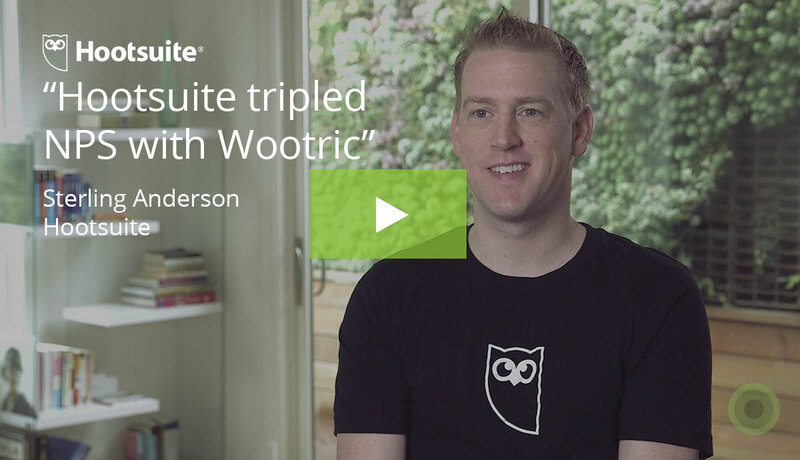 By working with Wootric to support their NPS needs, Entelo gained the ability to present attractive, single-question NPS surveys to their customers, while they were using the Entelo app. Instead of having to scan their email inbox, open the survey email, and then click through to complete the full survey, customers are now able to share their thoughts with Entelo instantly, and then continue what they were doing originally. 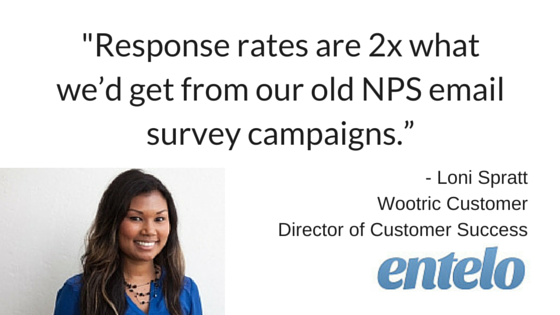 When Entelo first began to use Wootric’s in-app NPS survey, their response rate quickly jumped to around 60 percent, before leveling off at about 50 percent. Clearly, more than doubling their response rate in a short period of time was something that Loni and her team could get excited about. Her staff now better understands which customers are most at risk of churning, and can take action to prevent the churn from happening. 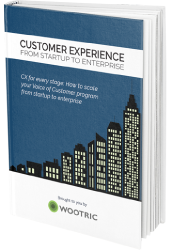 In addition to providing a wider look at the customer base, the Wootric data is also much more timely than data from email surveys. 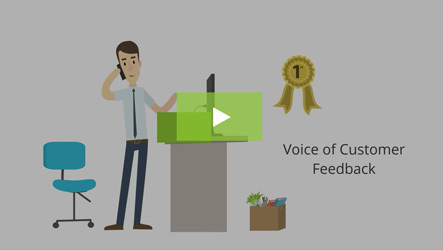 If a customer has a problem with their Entelo experience, Loni’s team knows about it immediately, and is able to pleasantly surprise their customers with how responsive they can be. Loni provided one specific example of how Entelo was able to use the Wootric tool to turn around a bad situation: when a user from one of the company’s largest customers submitted a low score, Loni was able to determine that the issue the user was experiencing with the Entelo app could actually be traced back to the user’s browser settings, rather than a problem with the app itself. 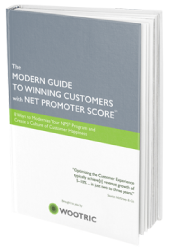 Net Promoter Score feedback with Wootric.